Each page must have one design designated as the active design. The active design is displayed by default when you navigate the prototype, either by clicking pages or by using live navigation in the prototype. In the Review interface, you can choose to display designs by name instead. Refer to Reviewing Designs for more information. A new page has a single blank design named Wireframe, which is the active design by default. If you create additional designs for the page, you can select a different active design. 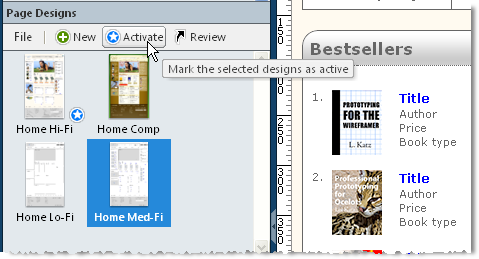 The design thumbnails are displayed in the Page Designs pane below the site map. The active design is marked by the badge. 4. Click the Activate button. The new active design is assigned the badge, and is automatically reordered to be the first design in the pane. As shown below, the active design is about to be changed.